Premium Vertical Enclosure for up to 16 output drop cables direct from the same box. Ideal for outdoor wall installation. 16 ports output: for subscriber connections with airtight plugs; fast installing with SC type. 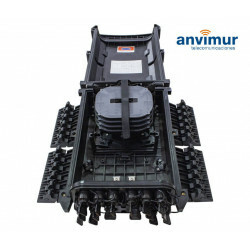 1- It possesses 2 Input Ports for uncut fibre of up to F12mm and 16 Output Ports for subscriber connectors with airtight plugs for fast SC type installation. 2- Shut with four pressure clips and four Allen screws for enhanced airtight sealing. 3- It includes 4 trays for up to 12 Fusion Splices and the capacity to house 2 PLC Splitters each. These may be flipped up to access the fibre distribution panel. 4- It includes another fixed tray where distribution fibre cables can be easily handled. The box has cable guides to prevent tugging. 5- It has 16 outputs for SC type subscriber connector for fast connection without opening the box. 7- It can be installed directly on a wall with a mounting, metal plugs and screws that are included along with the accessories. 8- It includes all the installation and mounting accesories.